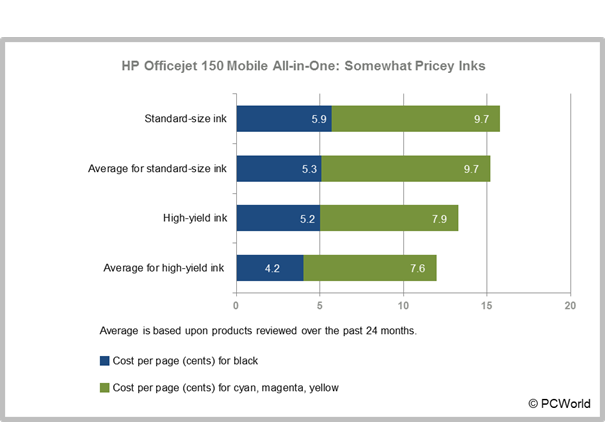 The price ($400, per HP) of a ticket to the HP Officejet 150 Mobile All-in-One show is steep, and it gets steeper when you take ink costs into account. If you're willing to ante up, though, you get a unique, cleverly designed, easy-to-use color inkjet multifunction printer that has Bluetooth connectivity for printing from mobile phones and devices. The unit's printing and scanning output are top-notch. The Officejet 150 Mobile connects via USB or Bluetooth. Perhaps there wasn't room, but we wish that it supported Wi-Fi for AirPrint, ad hoc networks, and the like. Setup is easy, and the scanning and Iris OCR software are competent. HP renders the print dialog area nicely, providing options for manual duplexing as well as multipage and booklet layouts. The two tricolor cartridge options are easier to differentiate: The HP 95 costs $32 for 330 pages (9.7 cents per page); and the HP 97 costs $44 for 560 pages (7.9 cents per page). The cost of printing a four-color page using the cheapest 94 and 97 ink cartridges is 13.1 cents--a little higher than the average. For even better photo quality, you can swap out the regular black cartridge for the HP 99 photo cartridge, which uses light cyan, light magenta, and photo black to create a richer palette. It costs $32 and lasts for about 130 photos, or 24.6 cents per photo. Editor's note: This review was corrected to reflect that the Officejet 150 Mobile All-in-One does not offer HP ePrint for sending print jobs remotely via e-mail. PCWorld regrets the error. This inkjet MFP gives you portable printing and scanning in a cleverly designed but expensive package.